We present equity analysts' bull- and bear-case views for some of the top-ranking coal stocks. NEW YORK (TheStreet) -- Peabody Energy ( BTU , Alpha Natural Resources ( ANR , James River Coal ( JRCC and Arch Coal ( ACI have consensus strong buy or outperform recommendations from industry analysts -- and they remain the favorite coal stocks of Mathew Christy, coal industry equity analyst at Standard & Poor's. Coal stocks, Christy notes, "provide a little more diversity and it's kind of a different investment vehicle vs. the typical energy company. When investors think of energy I think they think of the Exxon Mobils ( XOM of the world or the Chevrons ( CVX of the world, which are leveraged to oil. Coal stocks tend to give investors exposure to electricity production." Christy said that, historically, coal use for energy production has provided some insulation from economic upswings and downturns, given that customers still need to "turn on lights" and use energy. That said, Christy believes this supply-demand relationship may have been changing as metallurgical coal has become "significantly more of a swing factor in earnings and margins for coal companies." Unlike coal use for energy production, metallurgical coal is, of course, linked to steel demand, which in turn is linked to economic upswings and vulnerable to economic downturns. In an October client note, Deutsche Bank analysts David Martin and Jorge Beristain wrote that their long-term coal outlook remains positive. However, their steel outlook is more "cloudy" after prices rose in the summer, but then fell in September amid weak export and domestic demand. Analysts agree that coal stocks continue to be a useful, diversifying investment vehicle; yet their vulnerabilities -- metallurgical coal sensitivity to steel demand and economic cooling is one among a number of others -- are hard to ignore. "If world demand growth returns to its previous pace, supply tightness can keep prices high for an extended period." "Among U.S. producers, Peabody has an unique presence in Australia and is benefiting from high Asian prices vs. soft U.S. prices." "With vast undeveloped coal reserves in different regions of the U.S., Peabody can pick and choose where to break ground. This allows the company to operate under only the most profitable conditions." "Peabody leverages its market knowledge into profitable coal trading and brokering. This may also enable the company to realize better prices on its supply contracts." "We think Peabody's presence in the PRB (Powder River Basin) is on track to deliver higher margins and return on capital in the long run." "Peabody operates in a cyclical commodity industry. Abnormally high profits are merely a reflection of peaking conditions. There can be no free lunch, as robust profits will only attract more competitors." "U.S. demand is currently very weak, as electricity generation is falling due to the economy and low natural gas prices are causing fuel switching at the margin for utilities." "After the winter, there is still an inventory hang of 40 million tons in the U.S. Dissipating this excess will require painful production curtailments and a rebound in demand, which has not materialized to date." "Asian prices are now among the highest in the world. If these economies slow, the pullback could be swift and fierce." "As the U.S. market is looking better, the industry may start idled production capacity quickly, forestalling the recovery." Recent Analyst News for Peabody Energy: Not everyone agrees wholeheartedly with the consensus outperform recommendation for this stock. BMO Research has raised its target price for Peabody Energy to $56 from $49 and lowered its rating for the stock to market perform from outperform for valuation reasons. Peabody shares "have performed well and have returned to trading at close to a historic premium to the group." "Strong Asian demand in the long run should boost all coal prices, even though Arch doesn't supply material amounts directly to Asia." "We think the Powder River Basin benefits from several secular trends that will permit higher margins in the long run." "Arch has few legacy liabilities for reclamation, mine closure, employee health care, and retirement after divesting its Central Appalachian assets several years ago." "Even as the U.S. coal market is dramatically oversupplied, major producers such as Arch are taking the initiative in reducing production rapidly. This should help balance out the market quickly, especially if the economy recovers." "Arch's acquisition of Jacobs Ranch is a strategic coup that should produce long-term benefits." "Arch operates in a cyclical commodity industry. Abnormally high profits are merely a reflection of peaking conditions. There can be no free lunch, as robust profits will only attract more competitors." "The Jacobs Ranch deal may strain Arch's balance sheet if market conditions remain unfavorable through 2010." "Depending on how the government decides to regulate carbon dioxide, coal demand and prices could be dramatically affected." "Railroads out of the PRB (Powder River Basin) hold enormous power. Rising freight rates can easily eat away at Arch's margins." Recent Analyst News for Arch Coal: Raymond James analysts James Rollyson and William Eagan aren't completely convinced yet of the outperform consensus recommendation for this stock, although they did come away from the 2010 Arch Coal analyst day at the producer's Black Thunder Mine on a high note. "We came away from our trip to the Powder River Basin very impressed with the efficiency and vastness of the operation." They said they were "warming up" to Arch Coal, given its leverage to the improving coal markets and its strengthening balance sheet. "However, we are maintaining our market perform rating as we believe there are companies with more attractive valuations at the moment." "James River will generate positive free cash flows in 2010 and probably 2011 as well, thanks to fortunate contract making in 2008." "James River gained a bit of breathing room by issuing gobs of shares as its stock soared in 2008 as a result of high coal prices. It also issued a large slug of convertible debt in 2009. As a result, the company has very strong liquidity today." "As it is close to Eastern U.S. population centers, Central Appalachian coal has a strategic advantage in terms of lower transportation costs that Western U.S. coal can never completely overcome." "Eastern coals are more likely to benefit from export demand. James River is also able to sell 'crossover' coal into the metallurgical markets if industry conditions warrant." "As utilities install sulfur scrubbers, the value of Illinois Basin coal should be enhanced." "Most of the factors that drive James River's success are not under the company's control: commodity prices, transportation and environmental policies. Adverse changes in conditions would curtail profitability." "Falling demand from emerging markets and generally depressed economic conditions are having an adverse effect on coal prices." "Well-publicized coal-mining accidents have resulted in increased legislative requirements for safety. 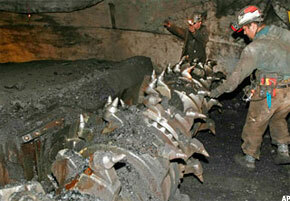 The new standards should significantly increase the cost of coal mining in Central Appalachia. These pressures may intensify, thanks to a recent major accident in West Virginia." "James River's mines and reserves are structurally disadvantaged, with higher costs and lower margins than large rivals." "Being a relatively small, high-cost operator, James River is much less flexible, both financially and operationally, than larger rivals." "The factors that drove coal prices up earlier in 2008 -- global supply constraints and robust demand from emerging countries -- may re-emerge if the global economy recovers. In this scenario, Alpha will benefit greatly." "Alpha will gain some valuable geographic diversification in the Foundation deal. It will no longer be disproportionately be affected by Central Appalachia-specific issues." "Both Central Appalachian and Northern Appalachian coals are attractive for export, should international demand return." "Extremely robust metallurgical coal demand in the international markets is allowing Alpha to sell some lower quality coals into these markets at significantly higher margins." "The PRB (Powder River Basin) is a very attractive coal basin, with extremely low-cost and easy-to-access reserves and oligopolistic competition." "Alpha operates in a cyclical commodity industry. Abnormal profits will attract competition, eroding returns in the long run." "Most of the factors that drive Alpha's success are not in the company's control: commodity prices, transportation, and environmental policies. Adverse changes in conditions could curtail profitability." "U.S. utilities are facing ever more pressure to regulate their carbon output. Many are finding it difficult to approve coal-fired power plants." "Through its metallurgical coal production, Alpha is exposed to economic cycles overseas. If China or India experienced a slowdown or recession, the firm's results would be hurt." "Alpha is assuming a hefty load of legacy liabilities from Foundation, which will be a slow drain on the company's resources."